Member of Parliament (MP) and the supremo of Tripura Upajati Ganamuti Parishad, the tribal wing of CPI(M), Jitendra Choudhury, on Tuesday alleged that incidents death due to starvation has taken place in the BJP-IPFT ruled Tripura. MP Choudhury said this during a press conference in the headquarters of Tripura CPI(M) here. According to the MP, recently at least two persons died due to starvation in remote Longtharai Valley under Dhalai district of Tripura. The deceased have been identified as one Japandra Tripura and his granddaughter. The left leader alleged that due to lack of work under Mahatma Gandhi National Rural Employment Guarantee Act (MGNREGA), especially in the hilly areas, people mostly tribals were moving towards Bangladesh in search of food and collection of forest products. “But now nothing has been left and hence, starvation deaths have started,” the MP alleged. 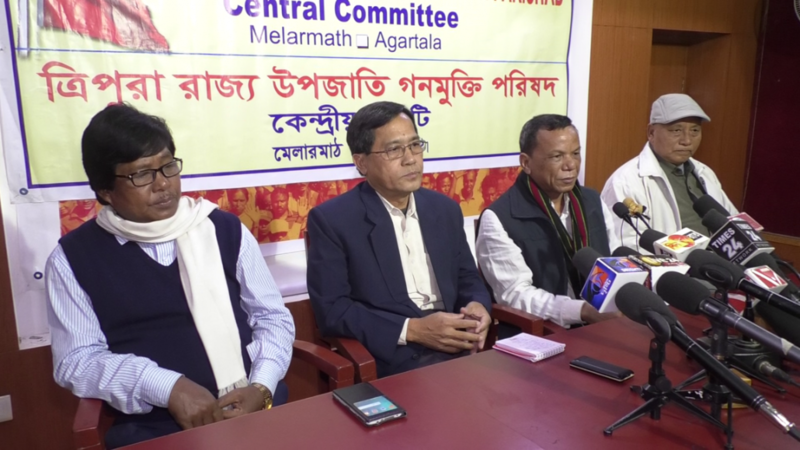 Choudhury also alleged that there was forceful conversion of 96 Christians to Hinduism on Sunday at Kailasehar in northern Tripura and demanded inquiry and punishment of the culprits behind the conversion. Meanwhile, on the arrest of 61 Rohingyas in and around Tripura, the left leader overruled security threat from Rohingyas and viewed that India as a big nation should influence the international community to resolve the Rohingyas migration issue.